Scones are one of my favourite breakfast or brunch treats. I love them because they are not too sweet and the basic scone dough is so versatile in terms of the fruit and seasonings you can add to it. One of the first items to appear in my spring garden – and one of my favourite spring flavours – is rhubarb; I have also seen local rhubarb at fruit markets this week. 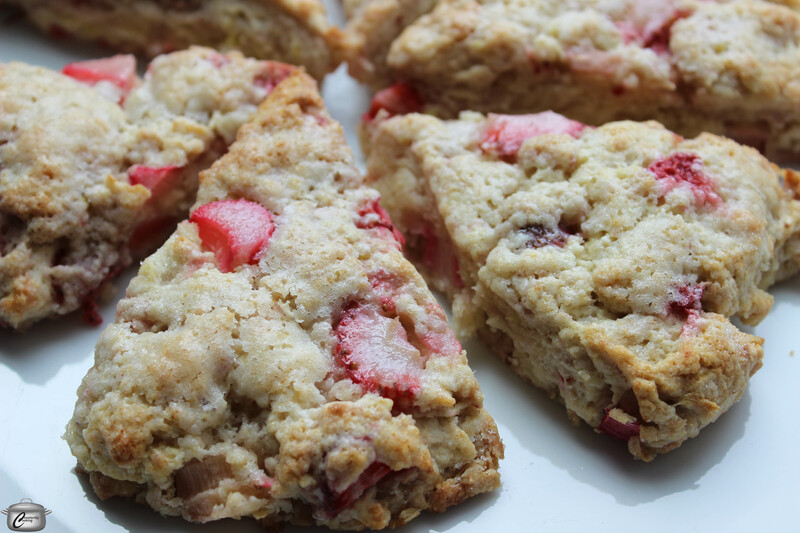 Strawberry and rhubarb are a classic pairing; the addition of a generous amount of ginger really perks up the flavour of these scones. You can make them with milk but they are particularly delicious when made with cream. They can be enjoyed warm or at room temperature and I dare you to try to eat just one. Strawberry and rhubarb are a beautiful combination in pies, jams or these delicious scones which get an extra flavour boost thanks to a generous amount of fresh ginger. Preheat the oven to 425F. Line a baking sheet with parchment paper and set aside. In a large bowl, combine the flour, 2 tablespoons of the sugar, the baking powder and salt. Grate the cold butter into the flour mixture. With two forks, toss the mixture together. Add the rhubarb, strawberries and ginger to the flour and butter mixture; stir to coat the fruit with flour. Pour the 1/2 cup of cream over the flour and fruit mixture. Using a large spoon, stir quickly with just a few strokes to combine. With clean hands, fold the scone dough over itself about ten times, working dry bits into the moist part of the dough. You don’t want to over work the dough as the scones will not be as light and flaky. If your bowl is broad enough, it’s easiest to do it right in the bowl; otherwise dump it out on the counter and work on it there. If your dough seems a little dry, you can add additional cream, one teaspoon at a time. You want a dough that holds together but is slightly sticky. When the flour has been incorporated, turn the dough out onto a lightly floured counter (if it’s not already on the counter). Pat it into a circle that is about ¾” (2 cm) thick. Cut the circle into eight wedges and transfer them to the parchment-lined baking sheet. Brush the tops of the scones with the remaining 1 tablespoon of cream and sprinkle with the remaining 1 tablespoon of sugar. Bake in the lower third of the oven for 12 – 14 minutes, until the tops are beginning to turn golden and a toothpick inserted into the thickest part of a scone comes out clean. Transfer scones to a rack and let cool five minutes, then serve. This entry was posted in Baking, Breakfast, brunch, Fruits and vegetables, Recipes and tagged breakfast, brunch, butter, cream, ginger, Mother's Day, rhubarb, scones, strawberry, treat. Bookmark the permalink.